Check out this totally awesome truck I found! My husband and I went out to Port Costa for dinner with his parents and happened across this classic Chevrolet truck. I hadn’t planned on taking outfit pics, but the photo op was just too good to pass up. In addition to the old-timey “Prof Salt’s Coffee Co” sign, there were chicken plushies in the passenger seat! Rather irresistable, don’t you think? My dress fit in quite well, given that it’s a handsewn vintage dress from the late 1940s or early 1950s. It’s got a somewhat unusual floral pattern, with abstracted black and grey vines amongst the green leaves and purple flowers. 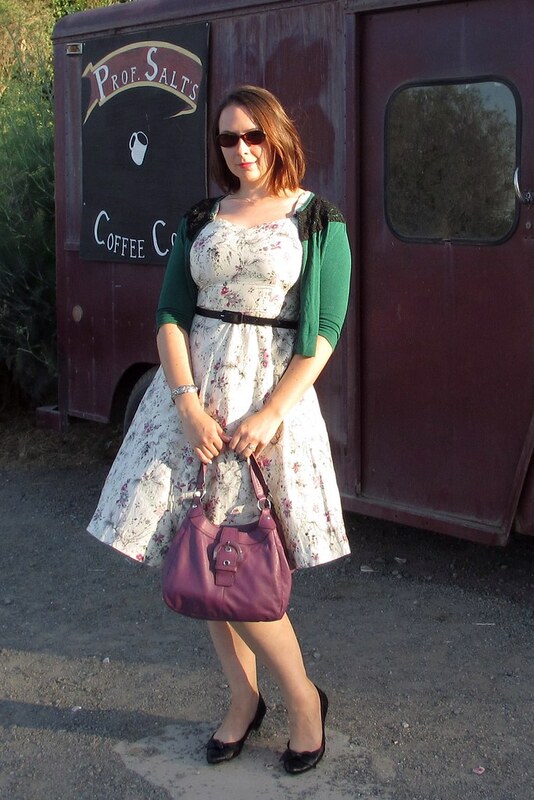 I paired it with a green cardigan and purple handbag, plus black shoes and belt for contrast. The black lace on my cardigan helped pull it all together. So cheers! to Professor Salt. I don’t know what your coffee is like, but I sure do love your truck! 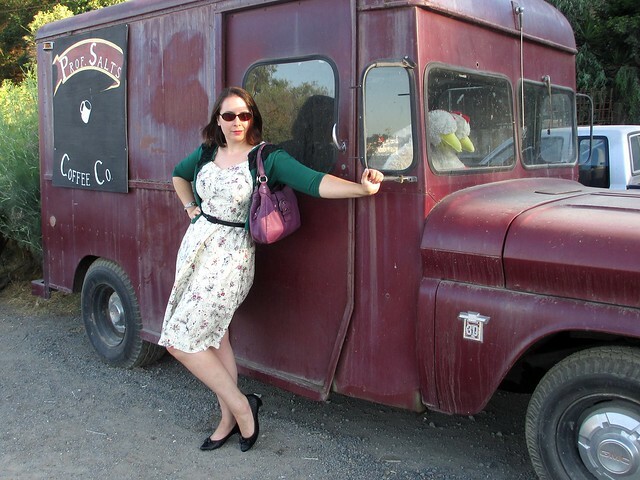 I doubt any blogger could have reisted a photo opportunity like this one – that truck is just precious! I absolutely love your dress, too. The retro, feminine style is just lovely. 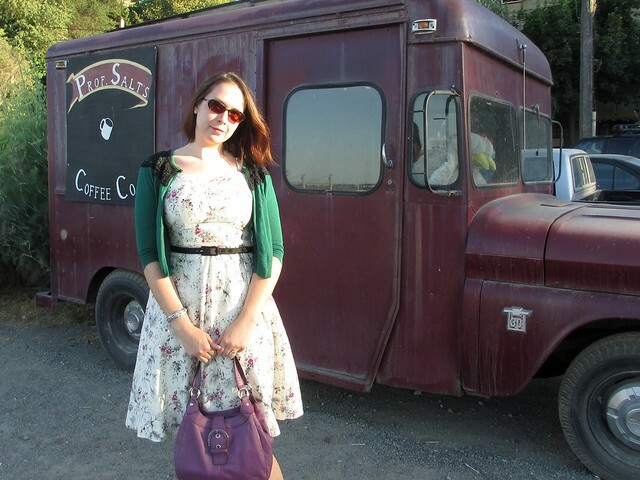 I love the rich colour of that cardigan against that beautiful floral dress! You look adorable! I love that you found this truck for your photoshoot. Right now, I’m wanting a ’50s or ’60s car for a photoshoot (my dad has one, but is an hour away). I’m hosting a week of vintage next week and can’t wait! Thanks Mary Ann! Good luck with your classic car search – looking forward to seeing the results! that is a super truck! and you did match it quite well – i love your bag and cardigan! Thanks Nic! I *think* I got the dress from eBay – but it could be from Etsy. I used to do quite a bunch of vintage shopping online! 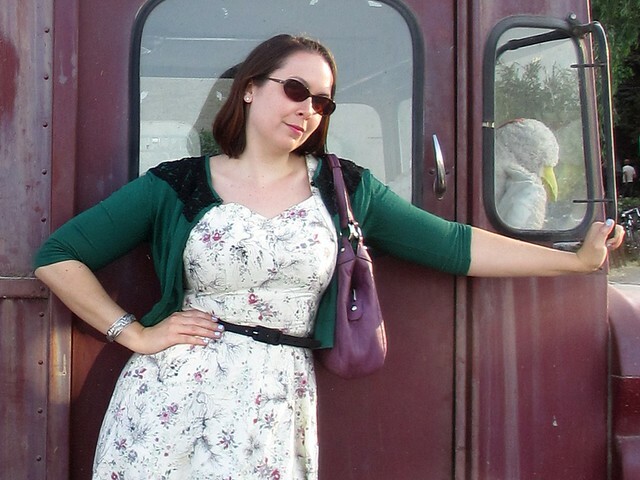 That’s a really beautiful vintage dress – and the fit looks really good. Also, that truck seems insanely weird…and fun.